China added more than 2 million kilometers of road in the past two decades, encouraging personal vehicle usage. Photo by Joe Dunckley. The Asian Development Bank released its 43rd annual report tracking sustainability data and practices across Asia and near Oceania. 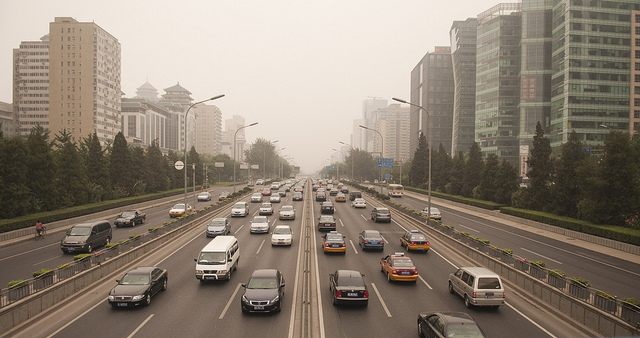 With “green urbanization” as the chief focus area for the report, sustainable transport is highlighted as a necessary means to lower the rapidly rising carbon emission rates, especially in China, which now surpasses the world average of CO2 emissions per capita at nearly 6 tons of carbon per person in China. Highlighting the motorization of Asia, the report also finds that the majority of Asia’s countries are greatly expanding their road networks, with China adding 2.6 million kilometers of roadway since 1990. A new report indicates that buses leaving one of America’s busiest transit hubs, the Port Authority of New York and New Jersey Bus Terminal, leave 12 percent late on average, with some lines lines leaving late more than 25 percent on average. NJ Transit, the transportation authority overseeing the dozens of commuter lines into Manhattan’s urban core, runs 10,000 buses through New York’s Lincoln Tunnel that have to compete with 110,000 other vehicles for mobility daily. This congestion correlates with a 34 percent growth in bus traffic projected for the next 25 years and can be summarized as “bursting at the seams” by NJ Transit Vice President Joyce Gallagher. The Pacific Northwest of the United States experienced population increases over the past decade, while decreasing gas consumption by 4 percent, indicative of the lowest levels of gas consumption either state has experienced in 50 years. The region, comprised of the states of Washington and Oregon, is consuming gas at markedly decreasing rates due to increased vehicle fuel efficiency and decreased net auto use, according to the Sightline Institute. Research Recap, November 12th: Bike Lanes Yield Growth, Baby Boomers Driving Less, Transit Favors the Skilled in D.C.